Re-issued in 2014 after being out of print for years! This impressive limited edition quadruple disc (4xCD) set hits you with 75 tracks, including high-profile artist collaborations, ''A'' list producers, trunk rattling beats and insanely raw lyricism. Never before has a CD set been so impressive, including tracks spanning a career from its early beginnings in 1998 to 2006. ''The Gatalog'' is one of the most exciting and collectable releases ever, monstrous track listing and unique quad-disc packaging. Initial limited pressing sold out long ago, so don't miss out this time around! 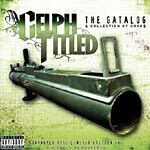 Celph Titled is not the best lyrically but he can spit some dope/funny lyrics. Pretty dope production also. Nothing classic but with 4 cds with good material, you can't go wrong with this.